So much has happened since I last posted here that I'm not sure where I need to back up to. 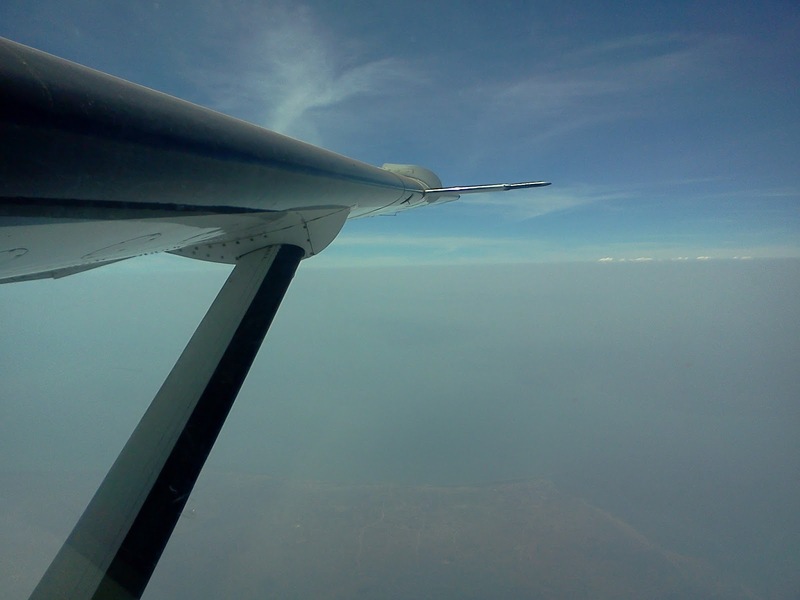 Since I last wrote, I have been preparing to fly the Cessna Caravan here in Uganda. Now, in a country like Canada, getting all checked out to fly a Caravan isn't really that involved of a process. You do what you need to do, take any tests that you might have to take, do any flights that you have to fly, then... PRSETO! You are able to fly the airplane! Here... not so much. I came home from South Africa and prepared to finish up the requirements to get the Caravan type rating included on my Ugandan license. Now, before I left to go down to South Africa, I had written the required type rating exam here in Uganda with the hope that it would be graded when I returned to Uganda and I would be able to have the rating added to my license shortly after returning home. This is how it COULD have gone. This is how it SHOULD have gone. Welcome to Africa. Scarcely 34 days after writing my exam, I learned that I had passed it. Now that I had officially passed the exam, they would begin to process my application to have the type rating added onto my license (I had applied for this several weeks earlier, in anticipation that I would indeed pass the test). About two weeks after that, I finally had my newly rated license in my hand. Whew. What a relief! What an answer to prayer! Now I am able to begin flying routes with passengers in the back of my airplane, rather than only being able to fly empty legs with our flight instructor. I have now begun to do this and am currently in the "Supervised Flying" stage, where I am Pilot in Command of the flight and have full responsibility for the flight, but there is another MAF pilot who sits beside me, giving me advice and making sure that I am not doing anything wrong. In a couple of weeks I will be heading out by myself and then I'll be busy flying for the rest of the summer. I suspect that all of a sudden I'll be coming up for breath and find that Christmas is almost upon us. We'll see! A few weeks ago I was flying a leg with no passengers in the Caravan. Now, I was able to do this because the pilot who I was flying with was holds his Ugandan instructors license, and this enabled me to legally fly empty legs with him as long as there were no passengers on board. This let us classify these flights as training flights. The plan for the day was for me to fly the empty leg up to Pakuba, an airstrip located in central Uganda, where we would be picking up a group of people heading home after a short term mission. It was a nice, smooth flight there. It was great to be back in the left seat again, shaking off the rust that had already begun to accumulate in the time that had passed since I had returned from South Africa. It was a little bit surprising to me how much rust could build up in such a short time, but every minute of flying was bringing things back into the front of my brain (where it needs to be). This particular airstrip is located in a national park, and sure enough there were a few smaller animals on the ground around the airstrip when we arrived. After a short wait, the team showed up and we loaded up and headed back down to Entebbe, where they were catching a flight home later that night. On the flight back to Entebbe I was back in the right seat as an observer, since I didn't yet have the rating on my license. The flight south was also nice and smooth, and it was looking like this might be a fairly short day when the HF radio came to life with a request for us. There was a man up in South Sudan who had been in an electrical accident, and was suffering with severe electrical burns. We were being asked if we could make a quick turn-around in Entebbe and make our way back north and into South Sudan to medevac this man back to Kampala for treatment. Normally our flights into South Sudan depart in the early morning so that if there are any delays (weather or otherwise) we still have enough daylight remaining so that we can get back to Kajjansi that evening. We quickly did the math, and there was enough daylight remaining for us to get up and back if things went relatively well. Just another day in the life of a missionary pilot. The view from my office window at 18,000 feet. Landing at Entebbe, we quickly disembarked our passengers and called for fuel. In an unusual turn of events, the fuel truck turned up almost right away, and before we knew it we were ready to take off again. This was another empty leg, so I was back in the left seat and would be flying this leg up into South Sudan. Also, because we had no passengers on board and were flying on an instrument flight plan, we were able to request a flight level that required us to use oxygen. This meant that we would encounter less turbulence, fewer clouds, have a faster ground speed, and would also burn less fuel on the way north. It also meant that we had the joy of flying for a few hours with plastic tubes up our noses, but it really isn't that bad. It's worth it for all of the benefits of flying at that altitude. Landing in Yei (pronounced "YAY! "), South Sudan, we taxied up and shut down at the parking area. There was a contingent of people there waiting for us to arrive, and they were ready to get the show on the road as soon as we stepped out of the airplane. Some times this is a good thing, but some times it is not, and we hurried over to slow them down a little. 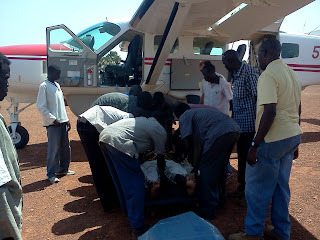 They would have needed to carry the patient quite a long way, and we suggested that rather than unload him and carry him, it might be more prudent to drive up to the airplane and then unload the patient there. They decided that this would indeed be the best course of action, and after transferring the patient onto our stretcher we loaded him up into our plane. He was in rough shape, with nasty burns on his right shoulder and most of his left leg. Securing him safely in the airplane was a little bit of a trick, but we managed to do so without causing him too much additional pain. We then loaded the other three people who were accompanying him to the hospital, and after making sure that everybody's travel documents were in order, we took off. It was now mid afternoon, and as is usually the case here, the weather was worse than it had been earlier that day. Normally we can climb to try and find an altitude where the air is smooth, but with a patient in the back there are other more important things to consider. As we climb the patient breathes less oxygen. Many injuries and wounds will also get more painful as you climb and the air pressure changes. There are other factors as well, but in this case we felt that it was best to stay a little lower than what we would normally fly on that route. Because of this decision, we bumped our way south for about two hours in the warm afternoon air. Thankfully, during the last half hour of the flight, the sun had dipped a little lower in the sky and the evening cooling was starting to happen, so we were able to relax a little bit and enjoy smooth air for the last part of cruise as well as for our descent into Kajjansi. Upon landing in Kajjansi we found an ambulance waiting there for the patient and with very little trouble he was loaded up and they headed off to the hospital. We always watch the ambulances leave Kajjansi with a bit of apprehension, as often the journey from our airfield to the hospital is by far the most dangerous part of their journey. Ugandan roads and traffic, coupled with the ambulance drivers desire to get there fast, can lead to much bouncing and pain for patients, as well as increasing the odds of a traffic accident on the way to the hospital. As far as I know, this man's journey to the hospital went well. I haven't heard any updates about the condition of this man in the weeks that have passed since we flew him here, but we pray that he is doing well, and that we will one day soon be able to fly him home so that he can get on with his life there. We also pray that we will have been a testimony to both him as well as to his friends and fellow villagers of the love of Christ, and that our flight that day might open up doors for someone to share the good news of God's love with them at some time in the near future.